Finally we have proof that human beings are part of the same evolving mind. “The Global Mind and the Rise of Civilization addresses one of crucial issues of our time, on which our future may depend: the relationship between human consciousness and the brain. The evidence that Carl Johan Calleman explores shows that mind and brain are not identical, as we have been led to believe. Minds are capable of things that brains cannot do. The implication — that we are more than our physical brains and bodies — will likely be regarded as the most important discovery of our era. Let Dr. Calleman be your guide on this exciting journey.” Larry Dossey, MD, Author: One Mind: How Our Individual Mind Is Part of a Greater Consciousness and Why It Matters. The exact nature and location of the mind has long been a mystery. Where does it come from? What makes it so powerful? To find out, we look back to the dawn of human civilization, and at the pivotal mental shift that created early civilizations. 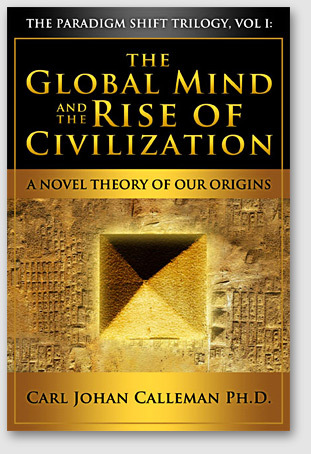 Dr. Calleman describes what inspired the ancient Egyptians, Sumerians, Jews and Mayans, outlining a new theory about the historical, psychological, geophysical, and neurological roots of the human mind. We may finally understand why monuments such as the pyramids and Stonehenge were built at the same time. This theory goes on to explain how a global mind, rather than the individual, has had the power to make empires rise and fall. A gateway of understanding has opened up to help us comprehend not only collective consciousness and psi phenomena, but also mental disorders. This first volume of The Paradigm Shift Trilogy provides the basis for how humans may craft the global mind of the future—and recreate our world.